The seed for this grid was LAP DANCERS, but Will preferred TAP DANCERS. Go figure. He even suggested a fix: make ADDLE ADD TO and CREAM CREAK. Since I hadn't had a puzzle accepted in more than a year, I was delighted to comply. The entire bottom half of the original grid [see left] required rework. Can you see why? If you guessed ESOP, OSSO, UTES, TETS, AGEE, SNERD, LEAS, LEVAR and LARA, go to the head of the class (it was pretty bad). NAVIGATE, BRACELET and CARELESS aren't very exciting, either. However, all's well that ends well. The SE corner is now my favorite part of the puzzle. I do have a small bone to pick with the cluing. Will replaced nearly three-quarters of my clues (a new record for me, I think). Two missing in action that I like are 46A ‑ Followed but never met [PARALLELED] and 31D - Tight slip [CORSELET]. Oh, and one more thing. Noticing that the grid contained both OAKS/OKS and LA LA/LAA-LAA, I clued OKS as 1-Across minus one and LA LA as 12-Down minus two. I never expected those clues to make the cut, but I thought it was worth a try. I'm looking for a course in remedial cluing if I can find one nearby. Perhaps, Swarthmore College will offer one in the fall. I should add that Will's cluing is a lot tougher than mine. ‘Dendrochronology,' what isthat? [And, I was worried that having BOLES in the grid might be a puzzle killer]. Hope you enjoyed the challenge, and kudos if you solved it without googling. I would have needed to google a lot. Love that wide-open middle, highlighted by the awesome DEMOLITION DERBY. That answer is elevated even further by such a great clue — of course, a DEMOLITION DERBY would require a "crash course"! Along with TAP DANCERS misdirecting toward business-type instead of dance-type companies, MINCEMEAT, FATCATS, IDITAROD, that's a lot to admire. I wondered if MALIA OBAMA was crossworthy. Of course, her first name gets used all the time in crosswords, and first family members are fair game. But I think about Michelle Obama's reaction to her kids being listed in 25 Most Influential Teens." Great quote: "They have done nothing to gain any influence." So, I personally wouldn't use either full name in a themeless, unless it served to hold other stronger entries together. So much of the puzzle was nice and clean. If it hadn't been for a few offenders ... but some of the offenders are serious red flags. Stu pointed it out already: BOLES to me is a Maleskan-era puzzle-killer, a throwback to the bad old days of crosswords where only people who memorized dozens of crossword-specific terms could even attempt them. Just as with ESNE or ADIT, I wouldn't have let a puzzle be published with BOLES. 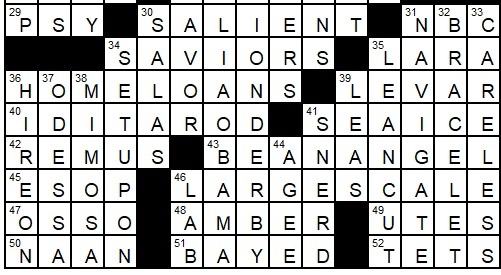 Crosswords have come a long way over the years, and terms like this need to be left behind in order to build new audiences. Minor dabs of crossword glue like LA LA, A TOY, SALAS (Spanish for "rooms"), STER are par for the course when it comes to wide-open white spaces. These days, however, the bar for themelesses is so high that it felt like the grid wasn't that polished. I would have happily given up TREE STUMPS, breaking up that answer by placing a black square at the first S, in order to get rid of STER, ESALEN (especially with the rough OVETT and ODILE — crossing each other! — already in the grid), and ALAR. So many great long entries, HOPE TO GOD, BELOW ZERO, playing KEEPAWAY, ALTER EGO, etc. A shame about the little flaws to go along with the really big one. Average word length: 6.03, Scrabble score: 317, Scrabble average: 1.59.